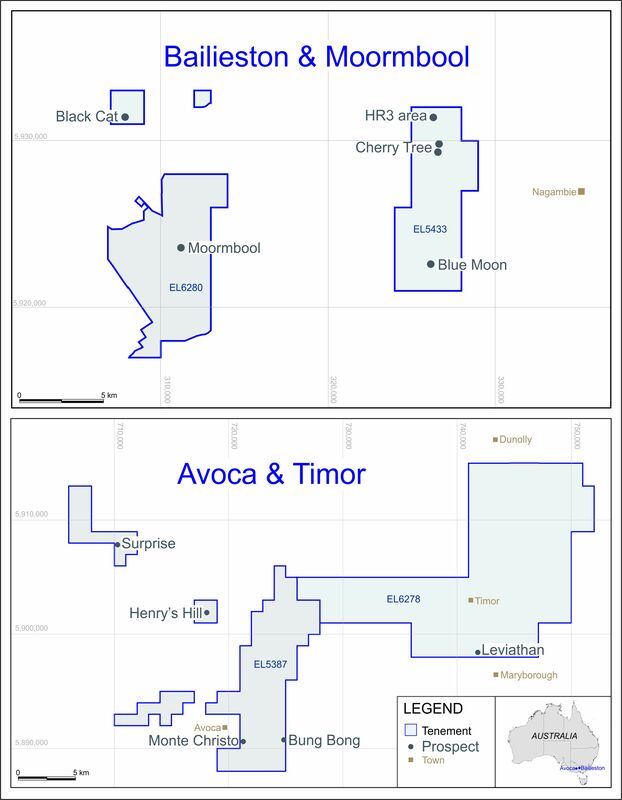 LONDON: 24 July 2017 - The directors of ECR Minerals plc are pleased to announce the results of the recently completed reverse circulation (RC) exploration drilling programme at the Bailieston gold project in Victoria, Australia. Reverse circulation (‘RC’) drilling has been used to obtain 1 m samples from which 4 to 5 kg of sample was taken. The 4-5kg sample was split and a 1.2 kg subsample fully pulverised, and a 50 g charge initially fire assayed. Subsequently, 1 kg was reassayed using a bulk leach. RC holes were completed with a 5 inch face sampling hammer. RC total sample was collected before any preparation. There is no information on whether or not there is a relationship between sample recovery and grade. Each 1m chip sample was systematically logged. Samples have not been photographed as yet. RC samples were split using a 3 stage Jones riffle splitter in order to obtain a 4-5 kg sub-sample. Where samples were wet, a tube was used to collect as good a sample as possible. Nearly all samples were collected dry. Very few samples were wet. The Bendigo sample preparation facility was inspected by Ivor Jones during a 2017 site visit and found to be suitable for purpose. Select samples were also assayed using a bulk leach to test for appropriateness of the size of the subsample being assayed and a much larger sample being assayed. There was very little difference between the bulk assay and the fire assay technique. 1 in every 25 samples was blank material, 1 in every 25 samples was a CRM. 62 pulp samples (~ 10%) were re-assayed using a BLEG technique. Based on the analysis of the results from the QAQC processes, it can be concluded that sample assay determination accuracy and precision is within accepted industry standards and contamination during sample preparation was not an issue. It is the author’s opinion that the sample preparation and assay determinations provided by On-Site assay laboratory are acceptable. There has been no twinned holes or other verification of data reported here. There has been no adjustment to the assays. Collar locations were recorded by GPS measurements. Down-hole surveys were systematically performed every 30m. Geographical data were obtained and reported according to the UTM zone 55S (WGS84). Elevation and accurate coordinates will be determined when the collars are surveyed. Data spacing varies between 50 m and 200 m along strike. Data spacing and distribution is not sufficient for the evaluation of mineral resources. Sample compositing has been applied for exploration results reporting. Drilling was performed towards the northeast whilst the mineralisation is northwest-southeast striking. Drilling intersects the mineralisation at a relatively high angle and is not expected to cause any issues in the evaluation of the project. Samples were individually bagged and sealed in larger bags of 10; the bags were under the direct supervision of ECR until they were delivered to the laboratory, and always on the same day as the sample was drilled. There has been no external review of the sampling and assaying procedures. The Bailieston project falls within ECR’s Bailieston (EL5433) tenement. The tenement largely falls within Crown Land. EL5433 is due for renewal in March 2018. EL5433 is subject to a royalty agreement with Currawong Resources Pty Ltd.
Work completed by earlier companies has been used to guide the Company’s exploration on the Maori trend. However, exploration has been very limited on the Scoulars trend. Mineralisation appears to be a disseminated style of mineralisation associated with disseminated and oxidized hematite with minor quartz. Drill hole information has been tabulated as a part of this report. Exploration results have been averaged over the entire intersection of interest using a value of 0.2 g/t to define the limits of the low-grade intersections. There are no metal equivalent values considered. The drill intercepts are interpreted to have intersected the mineralised packages at a high angle. A plan of the Bailieston project area showing geochemical results and interpretations has been made available previously. This has been incorporated in the tabulation of the results in this report. Exploration should continue along the geochemical anomalies to test for any significant mineralisation. Whilst the grade at Scoulars is relatively low, the mineralisation is relatively thick and shallow. It is recommended that this mineralisation is further tested to see if a bulk low grade resource can be identified. Follow-up drilling on the Maori trend should also be considered. Additional exploration should cover the Byron Shaft area.